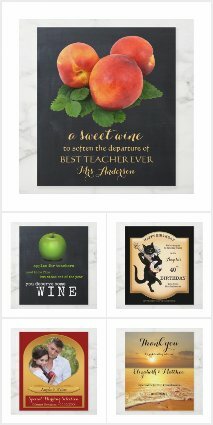 You can also check out the entire collection of chocolate boxes or take a look at more Valentine’s Day gifts or wedding gifts. 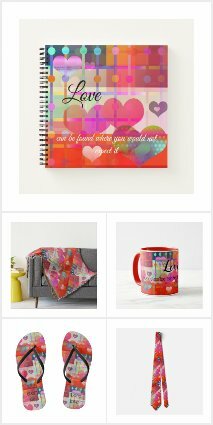 On the product pages you can transfer the design to another product that Zazzle offers, if you like! You can also check out the collection of Valentine’s Day cards and invitations for more ideas! Most people love chocolate and today I am featuring custom chocolate gift boxes. This one shows an artistic design with cherry blossoms on a plastered wall with rose gold and peach background. As always, you can customize and/or delete/add your texts. Of course you can also customize this box for a birthday or other occasion. As the theme is love, this unique pattern design bag can be used all year round! And as the saying goes: it’s always Wine O’Clock! I’ve selected a luggage tag featuring a cute and beautiful frog. Although you might not instantly see it, in reality we are dealing with royalty here … so dare to kiss the prince!